You may associate Margaret Green Animal Rescue with cats, dogs and perhaps small animals and horses, but what you might not realise is that we also rescue wildlife! We are recognised by the British Hedgehog Preservation Society as an official rescue centre for hedgehogs and in recent weeks we have seen in influx in juvenile hedgehogs needing our help. We are currently caring for six juvenile hedgehogs at our Church Knowle Sanctuary. Three were brought in after a dog owner found her dog playing with some new ‘balls’ in the garden and three more were brought in by worried members of the public. Some of the hedgehogs were riddled with worms where they had been unable to build up an immunity of their own. Without treatment, lungworm will almost definitely kill an affected hedgehog. The six hedgehogs will remain with us until the spring when, all being well, they will be released back into the wild. Hedgehogs that are born later in the year may be too small to hibernate and will struggle to survive as the temperatures drop. If you observe a hedgehog out in the daytime in November or December, there is a serious problem and the hedgehog will need to be rescued. However, adult hedgehogs may feed at night during spells of mild weather so if in doubt, please call Margaret Green Animal Rescue for advice. You may also observe a hedgehog that won’t eat or is wobbly on its feet ­ these hedgehogs are also in need of urgent help. If you find a hedgehog in your garden during the day at this time of year, it will most definitely be struggling with the cold. Hedgehogs should be tucked away in hibernation at this time. To rescue the hedgehog, firstly line a high sided box (they are good climbers) with newspaper and put it in a warm area. Pick up the hedgehog using a towel and pop both the hedgehog and the towel in the box. 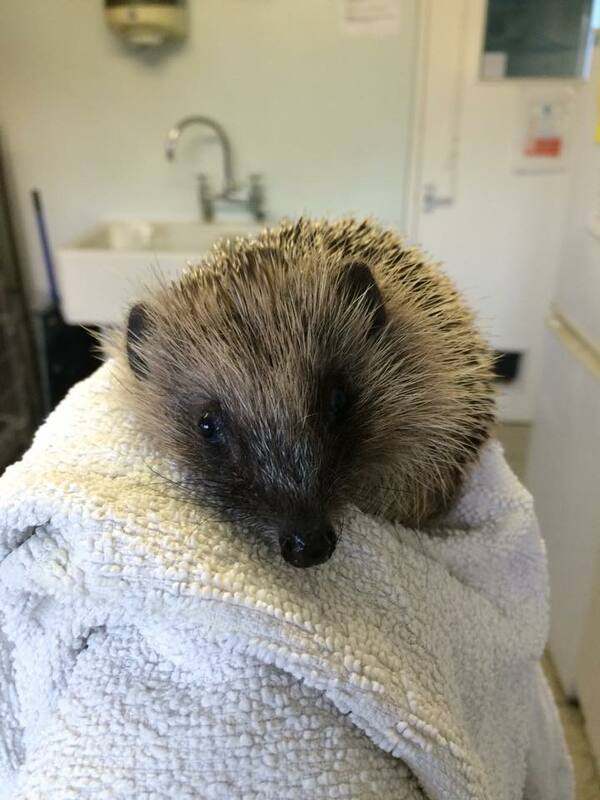 Lethargic, cold or wobbly hedgehogs may also need a warm hot water bottle wrapped in a towel as well. Offer the hedgehog some water in a saucer or shallow dish. The hedgehog may also be hungry ­ if you don’t have specific hedgehog food you could offer it some wet dog food as long as it isn’t fish or with gravy. Cat food is richer and so dog food is better if you have it. Following this, please call Margaret Green Animal Rescue on 01929 480474 or seek advice from the British Hedgehog Preservation Society.